Owings Mills, Md. 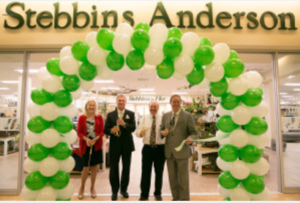 (April 21, 2016) — Greenberg Gibbons announced today that Stebbins Anderson has reopened in a revitalized 20,425-square-foot space at the Shops at Kenilworth – part of the $20 million renovation plans for the landmark shopping destination in Towson, Md. From left to right: Baltimore County Councilwoman Vicki Almond; Brian Gibbons, Chairman and CEO of Greenberg Gibbons; Ken Knight of Stebbins Anderson; and Baltimore County Councilman David Marks. A locally owned department store that’s been in the Baltimore area since 1867, Stebbins Anderson offers a one-stop shopping experience for a variety of merchandise, including unique housewares, gifts, décor, indoor/outdoor furniture and hardware. The new store features an updated storefront and interior fixtures while retaining its diverse selection of goods. It is also now completely located on the first floor of the property. The store’s remodeling was a crucial element in overall plans to revitalize The Shops at Kenilworth, which is undergoing a makeover that includes updating the exterior and interior into a more contemporary and welcoming specialty shopping and community gathering place. Retailers remain open and operational during the renovation, which is taking place in phases to minimize disruptions. Construction began last summer with a target completion date of spring 2017. Greenberg Gibbons began managing The Shops at Kenilworth in July 2014 and assumed full ownership of the property in April 2015. For more information about the renovation and to follow progress of the project, visit: www.GGCommercial.com/KenilworthRenovations.